This Halloween-themed slot, brought to you by NovomaticCasino.co.uk is full of dark magic. Straightaway when you load the game, you’ll see the background of creepy, dead trees and bats flying around in the dark, moonlit sky. The design is gothic, dark and mysterious and put together with the music and sound effects, you’ll feel as if you’re in a haunted mansion on the spookiest night of the year! Get ready for pumpkins, witches, black cats and bats! Although this slot may be spooky and scary, it is extremely generous; this 5-reel slot has an incredible 243 ways to win! Try it out and see if you can magic yourself up some wins! When talking about how cool the design of Pumpkin Power slot game is, it would be a crime not to talk about the amazing, gothic symbols. First of all, you have the lower-paying, classic card value symbols from 9 through to Ace. These are all designed in muted colours and with a gothic font which makes them perfect for this game. Then there is a blue candle, which adds to the creepy, dark vibe – imagine a house all lit with blue candles! There’s also a golden bracelet with a bat design and a ruby in the middle. Joining these symbols on the reels is a black cat and a haunted mansion and these two are the highest-paying symbols! Spin three or more matching symbols to get a payout – they must fall on consecutive reels from right to left. 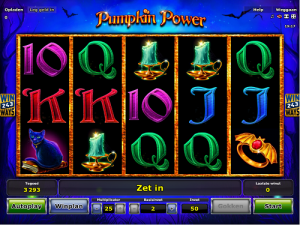 Pumpkin Power slot game has a standard 50/50 chance, double-or-nothing gamble feature. Whenever you get a win, you can choose to gamble it by clicking ‘gamble’ instead of ‘collect’. If you choose to gamble your win, you’ll be in with a 50/50 chance of doubling it, again and again! Choose correctly whether the next card will be red or black – get it right and you’ll double your win and get another go, but get it wrong and you’ll lose your win! The only time you won’t be able to gamble your wins is when you’re playing in ‘autoplay’ mode. This mode spins the reels for you automatically and so you can play without having to click and click and click! Note that you won’t be able to alter your bet whilst the game is in this mode either. There are two more symbols on the reels: one is the witch and one is the pumpkin. The witch is special as she can substitute for any other symbols except the pumpkin so she helps you get those wins! The pumpkin, on the other hand, triggers free games! During these free games there are two different pumpkins – one of them is a trick and one of them is a treat! Spin the pumpkin with the purple background and you’ll get a chance to roll the dice. When you roll the dice, it will land on a symbol and whatever number it shows, it will pay out the amount you’d get if you had spun that number of that symbol. So, for example if it landed on the black cat and showed the number 3, you’d get the same payout as if you’d spun 3 black cat symbols. We have plenty of other slot games and other games for you to choose from here at NovomaticCasino.co.uk. Our jackpot games, including: Jester Jackpot and Jackpot Crown, often pay out huge jackpots. Our table games and live casino games are high-quality and offer you the best RTP (return to player) percentages. Choose from: Sic Bo, Multiball Roulette, Live Baccarat, Live Poker and Live Blackjack and more!